One of the primary functions of a flexible coupling is compensating for both angular and parallel misalignment. But what if both the angular and/or parallel misalignment in the application is greater than what most flexible couplings can handle? This is where a universal joint (u-joint) can provide a solution! 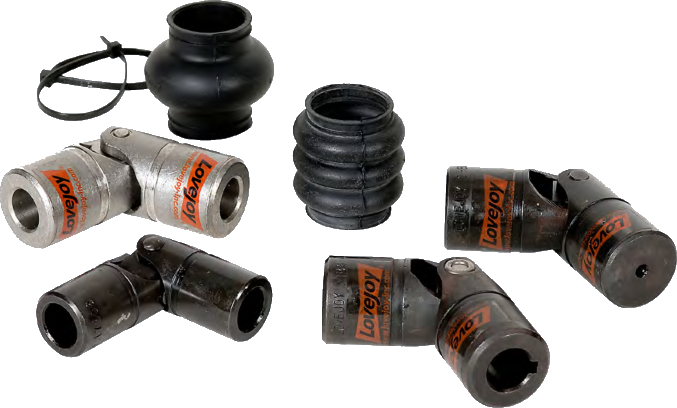 The unique features of a universal joint (and Lovejoy’s product offering) can provide customers with the best coupling fit for any application. U-joints provide a unique function in the role of a flexible coupling. Most flexible coupling designs offer from 1-1/2 to 6 degrees of angular misalignment. The u-joint has the ability to compensate 25 degrees of angular misalignment as standard and up to 45 degrees of angular misalignment with modification. The double u-joint type can provide larger amounts of parallel offset (amount dependent on size) than most other coupling types. This provides customers with a flexible coupling solution that can accommodate large amounts of both angular and/or parallel misalignment. The standard D type u-joint provides up to 25 degrees of angular misalignment. The DD type allows for angular and larger amount of parallel offset (amount dependent on size) due to its double u-joint configuration. The HD type allows for longer life due to the induction hardened yokes used in the assembly. The NB style uses needle bearings to compensate for applications requiring higher speeds (up to 6000 RPM). Finally, the LOJ and JR-4 types allow up to 45 degrees of angular misalignment in hand crank type applications. The amount of misalignment that a u-joint can compensate for is dependent on torque of the application, RPM, and the amount of angular misalignment in the application. Should you have any further questions, consult your favorite technical support representative for proper sizing and support.